Ever since I started using twitter I’ve kept an eye on the edtech thread, impressed and slightly overawed by the range of options teachers have when it comes to using online platforms to support their teaching. As much as I see the possibilities, it’s no surprise to me that lots of teachers turn away from the world of edtech. They may be sceptical that it has anything to offer (is it all too gimmicky, what are the opportunity costs…etc); they may have a natural and healthy aversion to being sold ideas by over-zealous enthusiasts (guilty as charged!) or they may simply find the whole thing too overwhelming to engage with. Where to start? How to find time to learn how it works? I’m acutely aware of the truths that underpin the parody take-downs; a caricature of students negotiating their personalised learning aims via twitter before navigating the virtual learning hub and creating their own interactive learning-audit spaces and personal reflection portals. So – there are plenty of barriers. I’m learning my lesson. My wife has created fabulous online support websites on WordPress to help students revise Biology GCSE and A level. There are lots of other options. A moodle-based VLE, KEGSnet is the mainstay of online activity for many teachers at my school. Others have used Tumblr and lots of teachers I meet are increasingly turning to googledocs for flexibility working across multiple devises and integration with existing ways of working. Facebook is the default choice for students at KEGS when it comes to setting up a group to organise events or share ideas within a limited set of people. I know Facebook are looking to develop school-secure applications. So, I’m not the person to ask about ‘the best way’ – I don’t really believe there is one. 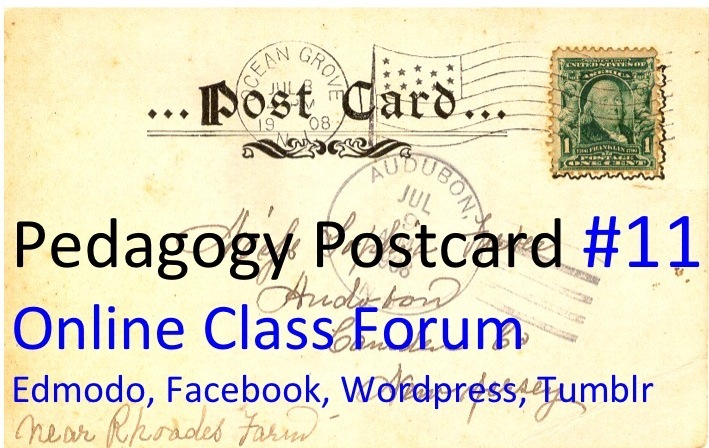 The general point is this: I think there is value to be gained from constructing an online forum that is dedicated to the work that you do in your lessons. Capturing a video of a demonstration for students to re-watch at any time. This is useful and very easy to do. Students can re-watch a demonstration, including the audio commentary, to help them with homework and revision or simply (and most importantly) for interest. The video above is of the classic collapsing can demo, undertaken by a student group. The video below was of the thermit reaction; a fabulous demo that is worth watching repeatedly. The thermit reaction, captured on video and shared. At several points in the year students have posted resources that they have found or I have done the same. This means that we don’t have to be confined to the lesson slot to exchange ideas. If I see something interesting that I’d like the class to see, I can upload it to Edmodo in a few seconds. The notification system means that they all receive an alert to tell them there is something new to look at ahead of the next lesson or just for general interest. The Slow-Motion video below was added spontaneously by Shashvat – he found it and shared it. Resource sharing in different forms. One of the examples captured here is a Powerpoint that a student, Alex, made for a lesson. The students know that the ppt will be put on Edmodo so they don’t have to worry about copying anything down; they can listen and engage. The final example is a research sample; students each researched an object in space and shared their findings. Here Devmin is responding to a comment on his submission. Edmodo has cut out a lot of time spent setting and writing down homework in class. We normally get someone to post the information and subsequent clarifications and reminders are easily issued. Here Kieret and Korede are giving instructions to their classmates about homework and revision. At this stage in the year, the expectations are set and we have some established protocols. Kieret is comfortable giving this instruction to the class clarifying the instructions discussed in a bit of a rush at the end of the lesson. 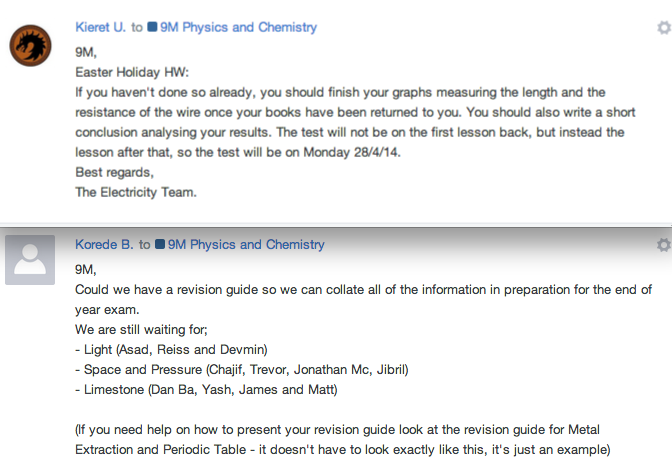 Korede is using Edmodo to chivvy up his classmates in producing revision materials that are expected from each group. There are numerous other features of Edmodo that I’ve explored including using the markbook feature to log test scores. We have also experimented with peer feedback as described in this post: Science co-construction continues with Space and Pressure. That had more mixed results. More generally, Edmodo provides us with a means of communicating in between lessons. That has a powerful effect on the way we talk about learning. We are not limited exclusively to the lesson-slot for exchanging ideas, resources or for doing the thinking. Simply by having a forum that can be accessed at any time, students start to talk about learning science in their own time; that becomes normal. They also have access to me and I have been able to give quick snippets of instruction on request. That learning is something you can and should do all the time and it’s not confined to what the teacher tells you to do. That you should take responsibility for your own learning but you also have a contribution to make to the group. That it pays to emulate the most successful learners – to see what they are doing and try to match them. That it’s always rewarding to follow your interests and to share them with others. In terms of pedagogy, it helps you to buy time. You don’t have to cram everything in. Students can read things in advance or you can send the details later. You can give a science demonstration knowing that they can watch it again on video; that affects the questions you can ask at the time. You can capture the work on your whiteboard in an image and send it on – that makes you invest in giving a good explanation that will be worth capturing. All these little shifts in emphasis add up to being quite significant, especially when students learn to use the system and build it into their routines. To my mind there are no opportunity costs; only benefits. You can teach more freely and directly, knowing you’ve got a way to follow-through via the online forum whenever you get a chance. Above all, I think the value from it comes from the sense of collective endeavour. We’re a gang, working together to learn about science. This is our private space where we share stuff – and it’s interesting, fun, challenging; and, for sure, we have to work really hard. But we’re all in it together. I like that feeling and Edmodo helps to create and sustain it. « Tackling Homophobia: RE GCSE – Not just a matter of conscience.